William the Conqueror must have thousands of descendants, but it seems quite a coincidence that I had thoroughly researched his life before I was aware there was a direct connection between us. I learned about that connection from Gary Boyd Roberts, Senior Researcher Emeritus of the New England Historic Genealogical Society (NEHGS) and author of many books, including The Royal Descents of 600 Immigrants to the American Colonies of the United States. A half-hour meeting with Roberts was part of a weekend research event at the NEHGS that I attended a few years ago. When I posed with this wax William in 2009, at the Bayeux Tapestry exhibit in France, I had no idea we were related. That royal ancestor was King Henry I, but the name did not ring any bells until I returned home and looked up Henry I on the Internet. Then I realized that Henry was the youngest son of William the Conqueror, about whom I had written a book!1 The book told the story of how William, Duke of Normandy, became King William I of England almost thousand years ago. Titled The Norman Conquest of England, it is one of several non-fiction books I have written for children. William’s own ancestry was actually Viking: the Normans were people from Scandinavia who began raiding northern France around 800 A.D. In 911, William’s ancestor Rolf the Viking took control of the area that became known as Normandy. William was born in Normandy around 1028, the illegitimate son of Duke Robert I of Normandy and a young woman named Herleve, who was probably the daughter of a tanner. Even as a child, William had many rivals, but eventually he succeeded his father as Duke of Normandy. In 1066, he famously crossed the English Channel and defeated the English troops at the Battle of Hastings. He was a powerful and violent man, and a good military commander. The story of how William the Conqueror evaded his enemies and invaded England is full of intrigue and coincidences. 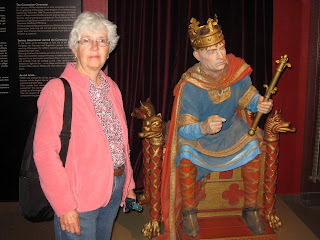 After writing about these events, my husband and I toured northern France, including Bayeux, home of the Bayeux Tapestry that illustrates the Norman Conquest. Little did I know at the time that William was one of my ancestors. After William I’s death in 1087, his son William Rufus became king of England. Following the death of Rufus, William the Conqueror’s youngest son became King Henry I. Henry, who had been born in England, ruled from 1100 to 1135. Well educated, decisive and energetic, he was known as the Lion of Justice. Henry married Matilda of Scotland, but the line of descent that leads to America was through an unnamed mistress. Their illegitimate child was Robert of Caen, 1st Earl of Gloucester. At generation 19 came Margaret Wyatt ( - c. 1675).2 She married Matthew Allyn (1605-1671) in Devonshire, England in 1626/27 and a few years later they sailed across the Atlantic, settling in Hartford and later in Windsor, Connecticut. 1. Janice Hamilton, The Norman Conquest of England, Minneapolis: Twenty-First Century Books, 2008. 2. Gary Boyd Roberts, compiler, Ancestors of American Presidents, 2009 Edition. Boston: New England Historic Genealogical Society, 2009, p. 408.